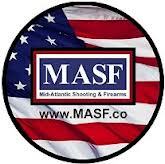 Our good friends over at Mid-Atlantic Shooting & Firearms need your help in getting to 5,000 Facebook likes and they are giving away gear to lucky contest winners. For full rules and to enter visit the MASF Facebook page. This entry was posted in MASF, Sweepstakes / Gear Giveaways. Bookmark the permalink.